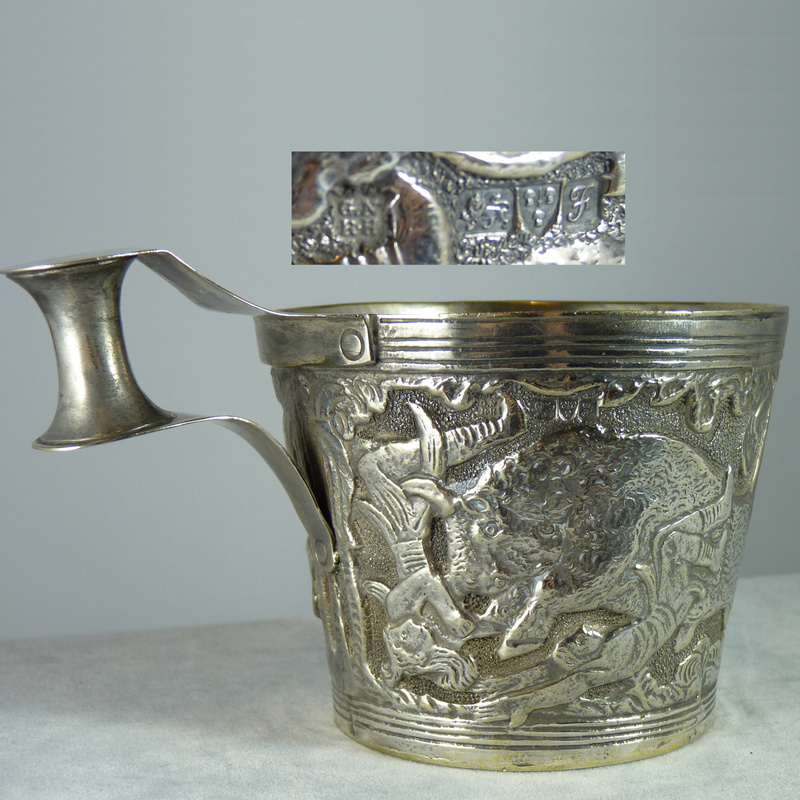 In Silver > Silver Cups and Goblets > Show & Tell and Arts and Crafts > Show & Tell. Although I hunt for treasure, sometimes I feel like the treasure has hunted for me. Here's an example of something I'd always wanted, that came to me in a quite unexpected way. A very dear elderly lady friend of our family was tutoring my daughter in dance and refused to take any payment, so I was looking for a gift for her. I searched a local auction site under "dance" (not one of my usual searches) and came across someone selling off items they'd bought in the USA, from the estate of the famous dancer, Martha Graham. 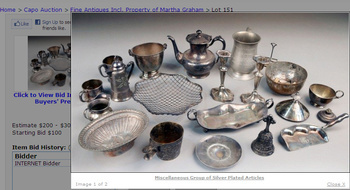 They'd bought one lot of miscellaneous silverplate for about $100 and were piecing out the items at $50 each. I saw a little silver bell that Martha could have used to start her classes and bought it for our friend, and then decided to try and find the original USA lot on my Live Auctioneers account. Sure enough it came up, you can see the entry in the last pic. 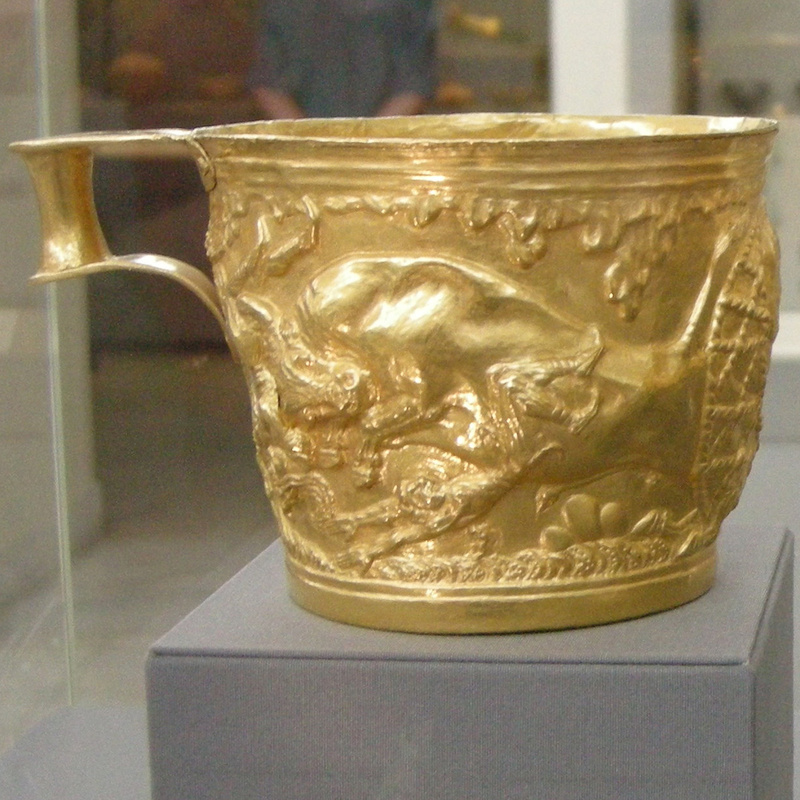 When I looked I was flabbergasted to see in the foreground something I'd always wanted, a Vapheio Cup. I'd already bought the bell, so had the seller's contact details - were they selling the rest of the lot? Sure enough they were just listing the cup for $50, no one else bid, and I got that too. 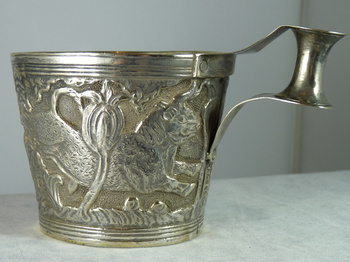 So it passed through a New York auction house unrecognised, then came to New Zealand, and again passed through a local auction unrecognised, dismissed as a silverplate trinket - a tchotchke. It's actually a 1906 hallmarked sterling silver George Nathan & Ridley Hayes Arts & Crafts replica of one of the Bronze Age gold cups from the Mycenaean-Minoan culture. 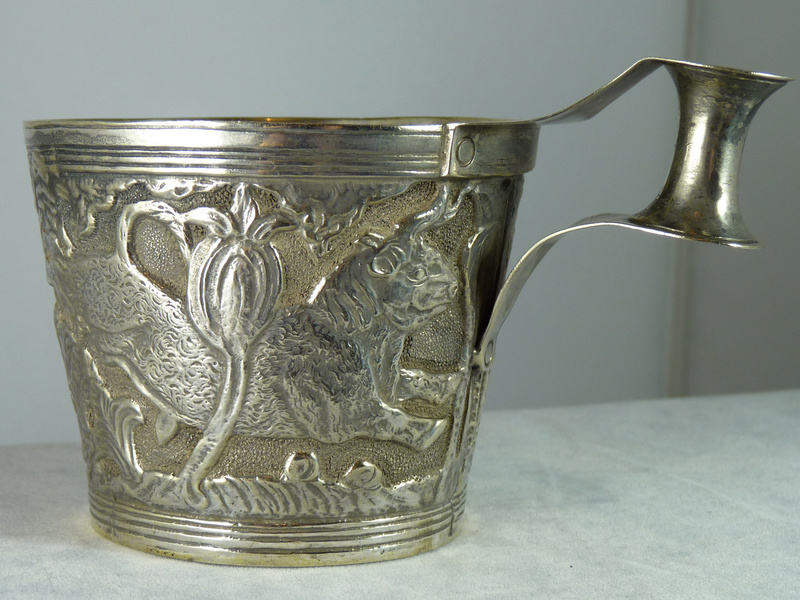 I collect Arts & Crafts silver, and had seen these in books, so knew exactly what it was. Martha Graham (May 11, 1894 – April 1, 1991) was an American modern dancer and choreographer whose influence on dance has been compared with the influence Picasso had on modern visual arts, Stravinsky had on music, or Frank Lloyd Wright had on architecture. She danced and choreographed for over seventy years. Graham was the first dancer ever to perform at the White House, travel abroad as a cultural ambassador, and receive the highest civilian award of the USA: the Presidential Medal of Freedom. In her lifetime she received honours ranging from the Key to the City of Paris to Japan's Imperial Order of the Precious Crown. Graham’s creativity crossed artistic boundaries and embraced every artistic genre. She collaborated with and commissioned work from the leading visual artists, musicians, and designers of her day, including sculptor Isamu Noguchi and fashion designers Halston, Donna Karan, and Calvin Klein, as well as composers Aaron Copland, Samuel Barber, William Schuman, Norman Dello Joio, and Gian Carlo Menotti. Influencing generations of choreographers and dancers including Merce Cunningham, Paul Taylor, and Twyla Tharp, Graham forever altered the scope of dance. Classical ballet dancers Margot Fonteyn, Rudolf Nureyev, and Mikhail Baryshnikov sought her out to broaden their artistry, and artists of all genres were eager to study and work with Graham - she taught actors including Bette Davis, Kirk Douglas, Madonna, Liza Minelli, Gregory Peck, Tony Randall, Eli Wallach, Anne Jackson, and Joanne Woodward to utilize their bodies as expressive instruments. She said, "I have spent all my life with dance and being a dancer. It's permitting life to use you in a very intense way. Sometimes it is not pleasant. Sometimes it is fearful. But nevertheless it is inevitable." GREAT STORY & a FABULOUS ITEM !!!! It's wonderful Paul and a deserved acquisition. Your knowledge is exceptional. OH BOY!!! I'm surprised this slipped through the auction houses so easily. It's beautiful! People ask me how I find my stuff and I usually respond "it finds me." Great story, Paul! I have found, more and more, that auction houses do little diligence except for the obviously "important" items. I bet they looked at all of the bits of silver and just stuffed them together in order to dump them. Also, if you look at older auction catalogs, you will find awesome research done on the items. Now, you are lucky if you get a 20-word description. So, to those who have the knowledge, the eyes and the luck, go the spoils! Your daughter's teacher is a lucky woman! She now has an icon that belonged to the supreme icon of modern dance. I was fortunate when I was younger to study her technique with several dancers that had been in her company. I also love that your thoughtfulness was quickly rewarded with such a stunning find! Hi Kyra & Bluboi, glad to know other people feel the vibe too, and critchpics, how cool that you studied with dancers who'd worked with Martha. I wonder how she came by this cup and whether it had any special significance to her. The Vapheio Cups depict the capture and domestication of wild bulls, (see: https://en.wikipedia.org/wiki/Vaphio) and historians speculate these bulls were used in the extraordinary Minoan practice of bull leaping, also known as bull dancing, something that would surely have interested Martha. What a story !! What a beautiful cup too!! Chester silver is getting more scarce on the market !! wow what a story, this item really waited for the right owner...something to dream of !!! thanks for this wonderfull dream and sharing this beauty! !